The effect is nice, but like the other Gugs, it's probably only playable in a Khopesh deck. 4 cost also hurts. Khopesh aside, what methods of wounding are there that don't rely on your opponent? Also the icon spread could be better, and at 4 cost I want a better ability. 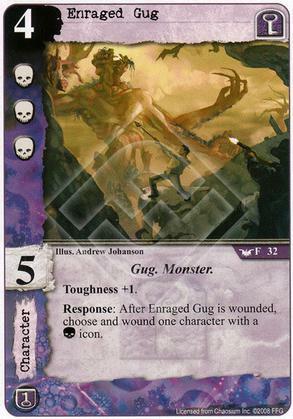 If you can get a Gug deck to work then all power to you, I'm certainly going to at least try. But I have a feeling its not going to happen. Only really usable in a gug deck where you can cheat him into play. Khopesh's or agency wounding effects can be used to trigger his ability but you have to rely on other gug synergy to heal him afterwards. Gug's are in a weak spot right now but we know at least one gug will appear in the next box so maybe this card will see some play then.